It’s not just know you have a problem to fix, it’s knowing that the problem was already fixed for you. 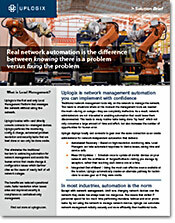 Uplogix is network management automation you can implement with confidence. Traditional network management tools rely on the network to manage the network. This leads to situations where at the moment the management tools are needed the most—during an outage—they are completely ineffective. As a result, network administrators are not interested in enabling automation that could leave them disconnected. This leads to many routine tasks being done “by hand” which not only consumes a large amount of time and effort, but also increases the number of opportunities for human error. Automated Recovery | Based on high-resolution monitoring data, Local Managers can take automated responses to device issues, saving time and service calls. Mass OS Updates | Schedule once to update all similar devices on your network with the confidence of SurgicalRollback—letting you manage by exception, rather than touching each device one at a time. Integrated Out-of-Band | Using the most cost-effective source available at the location, Uplogix automatically creates an alternate pathway for technicians to access gear as if they were onsite. Identify, isolate and solve network problems before you even know there’s a problem. With Uplogix handling the first few pages of your run book, you can focus on the tough challenges. According to Nemertes Research, IT staff at large enterprises spend between 30 and 50 percent of their time troubleshooting and fixing problems at remote locations. Users require continuous performance from IT and few things are more disruptive than a network outage. Finding and fixing IT problems remains a time-consuming, labor-intensive and expensive process. Skilled technicians must be dispatched, trucks roll or planes fly. Using device manufacturers’ best practices, Uplogix Local Managers have hundreds of built-in management procedures that enable the appliances to take action when certain conditions occur. Automate standard support routines | Uplogix provides numerous recovery procedures that allow you to automatically address common faults without human intervention such as automatically rebooting a hung, or wedged, device to multiple types of configuration recovery. A robust automation framework is provided for end-users to modify prepackaged or define sequential and conditional recovery procedures that align with their support practices (e.g. Clear Service Module -> Cycle Interface -> Show Tech -> Reboot -> Cycle Power). Recover from failed configuration changes via the powerful SurgicalRollback™ feature | This added “safety net” enables IT staff to make real-time to changes to network elements without the risk of failed configurations impacting operational performance. Reboot hung equipment | Uplogix’ automated diagnosis framework can automatically detect a hung, or wedged, device and instantly cycle power to the unit. The Uplogix Local Manager can often detect and resolve this common problem before traditional management tools even know it exists. Troubleshoot WAN connection issues | Uplogix can automatically detect common WAN problems, including outages or flapping circuits, and provide an instant diagnosis with the supporting trending or configuration data to speed recovery, document outages, or facilitate carrier resolution. 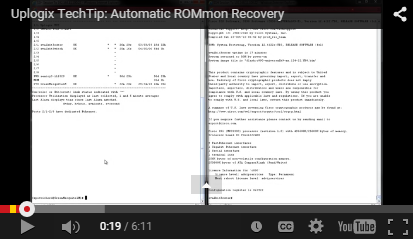 See how Uplogix Local Management can automatically recognize and recover a device in ROMmon state.